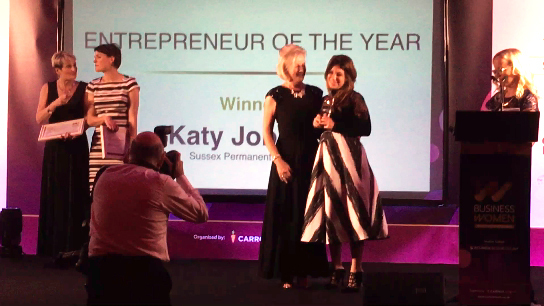 Congratulations to Katy Jobbins – Founder & Head Trainer at the Permanent Makeup Training Academy & Owner of Sussex Permanent Makeup, who is named Sussex ‘Entrepreneur of the Year’ for 2016. Katy was initially put forward for the award by Woman Entrepreneur Penina Shepherd (left), founder and MD of Acumen Business Law and author of the best selling business book – The Freedom Revolution. The Women in Business Awards recognise the amazing business women based in Sussex and celebrate the success of today’s very best females in Business. The Semi-Final cocktail event, previously held in September, was attended by over 300 original nominees for the awards. On this night the awards organisers reduced the ‘Entrepreneur of the Year’ category down to the remaining 6 finalists. It was at the glamorous black tie evening held on 25th November 2016 at the Hilton Metropole Hotel in Brighton, that none other than ourown Katy Jobbins was awarded with the NatWest Bank Sponsored ‘Entrepreneur of the Year’ award for 2016. ‘Entrepreneur of the Year’ Award for 2016 was Sponsored by NatWest Bank. Watch the 2 Minute Highlights of the Business Women Excellence Awards with the Official Video of the Awards Night Below. This award success follows a number of other high profile awards that both Katy and her Permanent Makeup Training Academy have won over the past 4 years. Amongst others, her Permanent Makeup Training Academy won the ‘Innovation in Business’ Award at the 2012 Business Matters Awards. Then in 2013 she was named ‘Woman of the Year for the Hair & Beauty Industry’ at the 2013 Sussex Woman of the Year Awards hosted by Olympic Gold Medalist, Sally Gunnel. 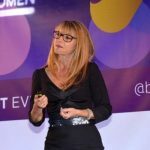 In 2014 Katy won the ‘Success Story of the Year’ award as well as being named ‘Overall Sussex Woman of the Year‘ at the 2014 Sussex Woman of the Year Awards, presented to her by the co-founders of the National Mumpreneur’s Networking Group. In 2015 her awards success was raised to a global level when she won the 2015 Global Business Excellence Award for ‘Outstanding Educational Services’. Towards the end of 2015, she won the AI Business Excellence Award for ‘Health & Beauty Training Program of the Year‘ for the UK. More recently, Katy won the ‘Training Centre of Excellence‘ Award at the glamorous 2016 etc. Magazine Hair & Beauty Awards. In the past she had also been shortlisted for 2 ‘Lifetime Achievement’ awards even though she only recently turned 30 years old! “Being named ‘Sussex Entrepreneur of the Year’ after seeing the long list of other successful female business women came as a huge shock to me. To say I was lost for words is an understatement, however I am so proud of the testimonials my students have given which show the support and dedication I have given to each and every one of them. If you would like to find out how to train 1 to 1 with Katy and start a career in permanent makeup, make sure you download the latest course prospectus (which includes prices and location options etc.) by inputting your name and email address in the form below.